With the Olympics well and truly under way, more medals were on the line in day 3 - and it was finally worth the wait as the hosts got their first gold, while there was a lengthy battle in team gymnastics and diving, along with much more action. Here, we recap all the sports from around Rio. In the individual eliminations, a massive upset took the headlines as world record holder Kim was knocked off by Indonesia's Riau Ega Agatha. Indian archer Laxmirani Majhi was unable to advance in the early stages of the women's individual, finishing three points shy of her opponent. Social media was also going wild as United States' archer Brady Ellison resembled actor Leonardo DiCaprio - but while the star won his first Oscar this year, his dopple ganger isn't on course to do the same with a medal. United States' women's team once again dismantled their opposition as they flew by Spain, winning 103-63 thanks in part to a 13-point hauling by Elena Delle Donne. Likewise, the males ran riot as well with the country's dominance showing no signs of letting up - despite a rough start, they were too much to handle for Venezuela, winning 113-69. Elsewhere in the action, Japan's women made light work of the hosts, while Australia marched to a straightforward victory over France. British heavyweight Lawrence Okolie was eliminated in the round of 16 after being out-pointed by Cuban Erislandy Savon, while his compatriots Antony Fowler and Galal Yafai also saw their Olympic runs come to an end. There was some success on the day for their team though, as Josh Kelly dominated Walid Mohamed. Ireland's Paddy Barnes suffered a shock exit at the hands of Samuel Carmona in the light-flyweight competition, losing by split decision and opening things wide open being one of the favourites to win gold initially. The Slovakian duo of Ladislav Skantar and Peter Skantar topped the qualification for the men's canoe doublee, with a time of just over 100 seconds at the Whitewater Stadium. The Kayak women's heats was topped by Stefanie Horn of Italy, with Britain's Fiona Pennie coming third in qualifying. The Chinese duo of Lin Yue and Chen Aisen secured gold in style for the men's 10m synchronised platform, highlighted by a stunning 4.5 somersault dive which raked in 106.56 points. It was a perfect way to follow things up after the women swept the diving the previous day. Americans David Boudia and Steele Johnson put up a respectable effort as they finished second, but it was nothing to phase the Chinese who were far ahead. There was some success for Britain as Tom Daley and Dan Goodfellow snatched a bronze medal in their final dive after a very nervy conclusion. Having lead the start of the contest, William Fox-Pitt suffered a huge setback sending him tumbling down the leaderboards. His horse, named Chilli Morning, refused to jump at the 20th - an error which the Brit blamed on himself -resulting in a sizeable 20 point penalty. Some solid rounds from Christopher Burton put the Aussie ahead after cross country, with the competition set to be wrapped up the following day. In an all-Russian affair, Yana Egorian made a comeback to edge Sofya Velikaya as Russia added a gold and silver medal to their tally. In the women's sabre individual, Egorian won 15-14 in a bout that may not have occurred had the blanket ban over the Russians came into action. For the bronze medal, Ukranian Olga Kharlan overcame Manon Brunet, reaching the 15-point win requirement by a five-point margin. 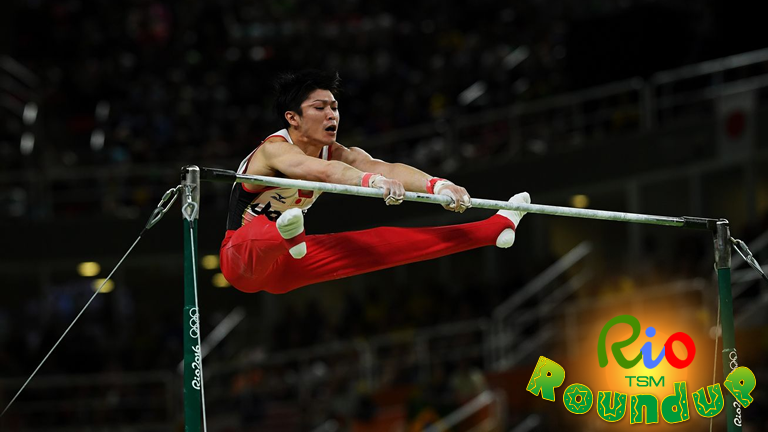 Japan dazzled the masses in a gripping gymnastics men's team final, with Kohei Uchimura continuing his fantastic form as they saw off Russia and China to take home the gold. Louis Smith struggled on the pommel horse, falling at one point, as Team GB's efforts failed to get on the podium. They were unable to catch up after starting on the rings and gaps separating themselves and China throughout - the Chinese themselves were absolutely distraught after a third-placed finish. Underdogs Angola scored a big victory over Montenegro to brighten their hopes to progress against the odds after picking up suspensions which left their side weakened. Netherlands got their first ever victory in the sport as they outstruck Argentina 27-18, while hosts Brazil eased by Romania. Great Britain's women used two quick goals in the second quarter to topple India at the Olympic Hockey Centre. Argentina dominated Japan, China cut off Spain and Netherlands blitzed Korea most notably in the women's other games. Germany defeated Canada 6-2 in the men's hockey. Rafaela Silva won Brazil's first gold medal of the games in 57kg women’s final, overcoming Mongolia’s Dorjsurengiin Sumiya to mark a comeback after a disqualification in the previous games. Rio's Cidade de Deus erupted as she broke in front and stayed there to win the tournament. Shohei Ono defeated Rustam Orujov of Azerbaijan in the men's 73 kg, coming from behind to win gold for the Japanese team. As a result of a postponement for the previous day, a packed rowing schedule was in store at the Lagoa Stadium. In the quadruple sculls, Germany won the repechage in the mens while Netherlands prevailed in the womens after a tight race with Poland. Great Britain were the fastest qualifiers in the men's coxed heat, while the single sculls saw Dongyong Kim win in the fastest time. Australia's women were crowned the first ever Rugby Sevens Olympics champions as they edged New Zealand by four tries to three, in a final where both exemplified why they are the finest rugby players in the world. An outpour of emotion with gold and silver determined marked the historic moment for the Aussies. There was no luck for Great Britain who, after a tough defeat in the semi-finals, were outplayed by Canada in the bronze medal contest. With winds ripping across the Escola Naval course, Britain's Nick Dempsey and France's Charles Picon took big leads in the windsurf while China and Croatia's sailors also lead their respective classes. Niccolo Campriani won the gold medal in the men's 10m air rifle final, with a score of 206.1 outdoing Serhiy Kulishh's 204.6. Josip Glasnovic won it for Croatia in the trap final, going to sudden death after they both hit 13 out of 15. Pellielo would go on to miss his shot, opening up for Glasnovic to give Croatia their first medal. There was some success for team GB with Ed Bling coming third. China's controversial Sun Yang prevailed in the men's 200m freestyle, overcoming Chad le Clos who came racing out of the traps with a well-timed swim which saw him break away at the end. Hungary's Katinka Hosszú was at it again as she broke ahead in the 100m backstroke, in a race which also featured a tie in the bronze with Masse and Yuanhui both getting a time of 58.76. 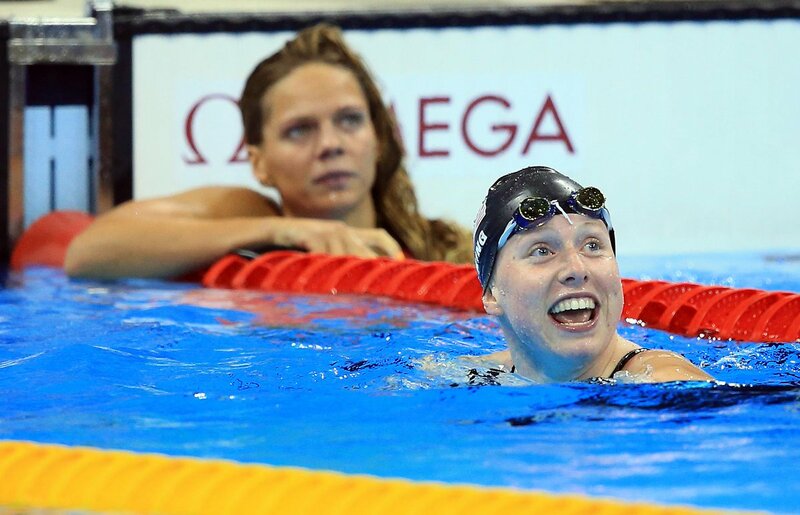 Ryan Murphy broke an Olympic record for USA in the men's backstroke, before Lilly King added to their tally winning gold in the 100m breaststroke. Paul Drinkhall of Team GB saw his run fall short of the quarter-finals as he lost out to Vladimir Samsonov, with what would have been an epic comeback not enough to phase his Belarusian counterpart. Dimitrij Ovtcharov and Bojan Tokic played an incredible first game featuring a total of 64 points. 53-year-old Ni Xialian, the oldest in the competition, was eliminated by Feng Tianwei. 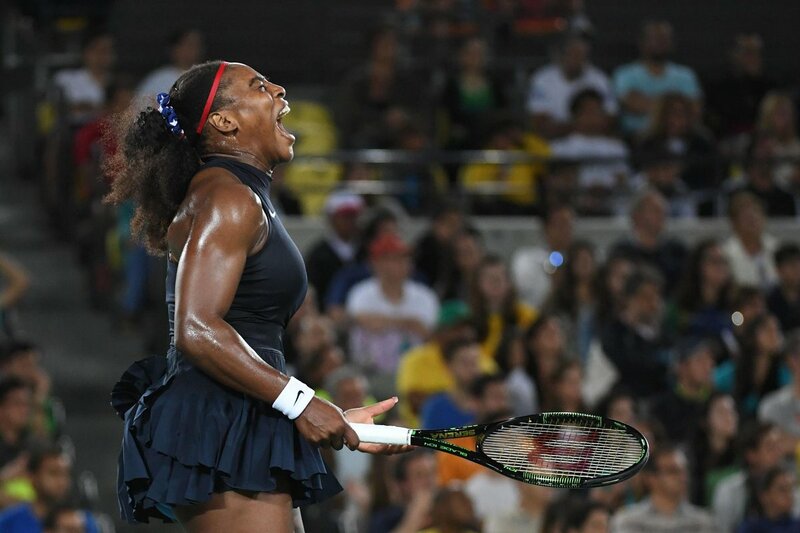 Serena Williams moved one step closer to defending her Olympic title as she defeated Alize Cornet for the first time in four attempts. The American didn't have it easy though, with her French opponent putting up a strong fight early on as she raced through the blocks - but Serena would prevail winning two sets. The Argentine support was in full voice as Juan Martin del Potro kept his run going, following up an upset over Djokovic by taking down Joao Sousa. He got through the first set, before being blown away in the second, then restored order in the third to move progress. Fifth seed Jo-Wilfried Tsonga was added to the backlog of upsets in the tournament so far, losing out to Gilles Muller. There wouldn't be similar with Angelique Kerber though, as the Australian Open champion pulled through a tough start to topple Eugenie Bouchard. Egypt appeared in Olympic beach volleyball for the first time ever as the duo of Meawad and Elghobashy were defeated 2-0 by the Germans Ludwig and Walkenhorst who continued their winning streak. China swept Italy, while Japan were dominant and the US evaded a scare on the women's court contests. The American duo of Walsh Jennings and Ross dispatched their Chinese opponents with the sun set at the Copacabana. Oscar Figueroa of Colombia had a total of 318 kg to win the 62 kg competition in what will be his final contest. Although failing to break an Olympic record with the gold medal secured after Kharki and Irawan fell short, he unlaced his boots and left them under the bar, signalling apparent retirement. There is no better way to go out though than with a gold medal in the pinnacle of his career. In the women's 63 kg, Olympic debutant Sukanya Srisurat of Thailand broke an Olympic record in her Olympic debut, totalling 240 kg to win a gold medal.